I remember, back a few years ago, arguing with a very difficult client who kept complaining that all his employees were incompetent, lazy or unwilling. It seemed that he had had only bad luck for many years, hiring the wrong people. After sending this businessman over 25 very qualified applicants for an executive position, I realized I had made a terrible mistake: I did not suggest that my client fire himself first, as the General Manager! After losing this client, I realized that this experience was a great lesson of humility. I must confess, I was not insistent or argumentative enough in my recommendations. So, through the next few years I had to witness the sad scenario of this personage who, so sure of himself and so intolerant of other people’s weaknesses, that he would drive his company to bankruptcy and blame everybody but himself for his misery. So, what is it that he did not understand? It always starts with the job description. 33% of new employees will quit their new job within the first 6 months. Reason #1: false expectations. At the base of EVERY failure to hire someone, you will ALWAYS find missing, incomplete of false information in the job description. In my personal experience, over 40% of small businesses in the USA start a recruitment process without having even written a job description. Apply the rule of transparency. Hidden data comes second as a reason why so many new employees leave within the first 90 days. Whatever the reason might be for having a vacant position, make sure you do not hide it. Openly disclose any delicate information that might lead a candidate to think twice. If they learn about it once on post, you will double the trouble. After one week on the job only, two-thirds of new employees believe they will NOT work for their new employer more than one year or two, maximum. The way you take care (or not) of your new employees within the first week will dictate their impression of your leadership as well as their level of engagement. In other words: you lose two-thirds of your new employees within the next year by not showing enough care at the very beginning. People don’t quit their job, they quit their boss. 3 out of every 4 new employees will leave their job because of rough, un-caring seniors. Any executive who seriously believes that every employee is stupid or incompetent ought to fire himself or herself first – biggest lesson I got from my experience mentioned above. I have seen some articles pretending that people quit their job – not their boss. Well, they quit their job because they hate their boss… that is my conclusion after 30 years of observation and experience. It is amazing that some business owners who work 80 to 90 hours per week and hold multiple hats in the business will refuse to spend enough money to promote a vacant position. They do not understand that the employment market is currently 100% candidate-driven – meaning: good applicants have the power of choice. So, you need to be much more aggressive than just posting your ad on one or two online job boards. You need to post it on 50 to 100 of them! And it takes a marketing budget to do so. And guess what: your more aggressive competitors will attract the good guys and you will get only the lazy ones. Because the truth is: your challenge is NOT to find good people, but to ATTRACT them. If you have no idea how to aggressively promote a vacant position, ask me. The real cost of a bad hire. You think you do not have enough budget to do what it takes to hire good people? Think about it again: the average measurable cost of a bad hire is around $5K within the first month for entry-level positions, around $10K for sales reps and mid-level management positions and around $20K for any executive position. Multiply these numbers by 1.5 for every additional month. Wonder how I came up with such numbers? Ask me! Soft skills make the difference – NOT hard skills. It always amazes me that the majority of small business owners are so focused on hiring people with the right technical skills. They are willing to blindly pay a premium for a more “experienced” new employee, only to realize that competence and willingness are two very different attributes. There is ample evidence that the vast majority of terminations are due to a serious lack of soft skills – such as team spirit, communication skills, willingness to learn, etc. – rather than a lack of technical competences. To be honest, this is the hardest point I try to communicate to my clients. For some reason many believe that they will have to spend less time and energy to make a new employee productive if they already know the business and the position specifics. Here is the hard truth about soft skills: 89% of hire failures are due to personality-related weaknesses. Only 11% of hire failures are due to technical incompetence. Your business profitability depends more on your ability to hire and retain good people in the company, than on ANY other management function – Period. Take control of your hiring actions! Become a HireMaster. 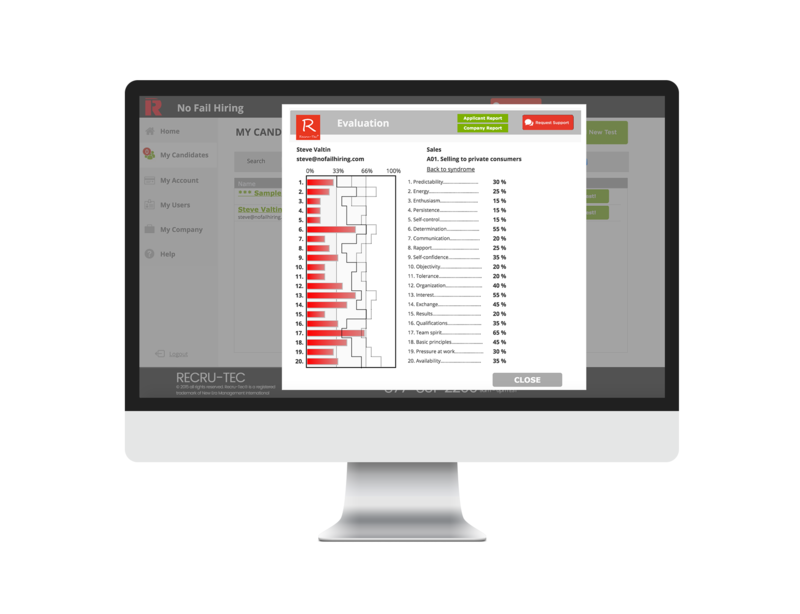 The RECRU-TEC™ Test is a one of a kind pre employment testing technology. It filters each applicant through 20 different soft-skills. The RECRU-TEC™ Test is a perfect Quality Control tool for your hiring missions. 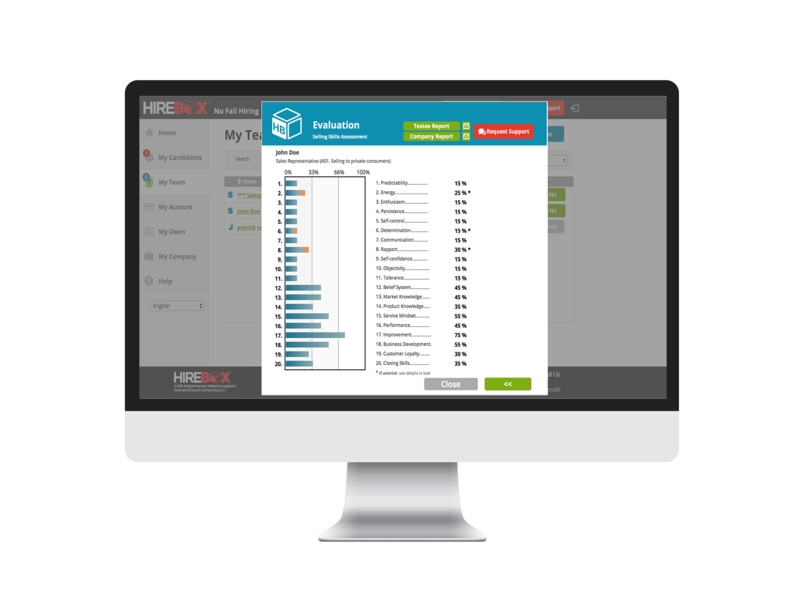 Based on more than 22,000 candidates’ evaluations in 25 different countries, this unique diagnostic tool is a job matching test which provides vital information about your future/potential employee. Give it a try today and see how powerful the RECRU-TEC™ Test is! The Pre-Selector is a very effective and fast pre-screening assessment, universal to all applicants. Whatever the position, you want to evaluate candidates’ ability AND willingness to contribute to the success & happiness of their team members and of your organization. This unique pre-screening assessment evaluates every applicant against 6 universal characteristics which have proven to: Make people happier and more enthusiast on a job and contribute to the success & happiness of others in the group. The JOBSTAR™ Test is a one of a kind employee performance appraisal and job satisfaction assessment.The JOBSTAR™ Test is a perfect Quality Control tool to ensure optimal performance, happiness and engagement from your employees.